Get the most out of your Chamber Membership with this FREE Webinar. Learn how to get more from your Chamber membership during our first ever live webinar on Friday April 6 at 12 noon. We will show you how to create your member log in for the Member Information Center (MIC) and then explain how to add text, logo, pictures and more. You will be able to ask questions as we go. 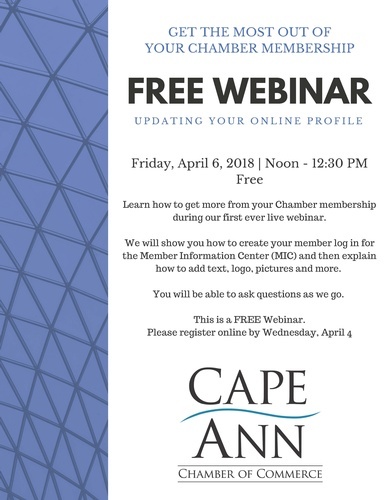 To take part in this webinar, log on to capeannchamber.com/tutorials at Noon on April 6. Webinar brought to you by Streamography.